Based in Porto Alegre, Brasil, Forjas Taurus (translation: Taurus Forge) is a diversified, international company and one of the largest small arms manufacturers in the world. 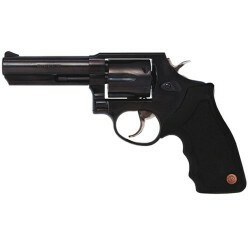 The company produced its first revolver in 1941. In 1970, Bangor Punta, which owned Smith & Wesson, purchased a controlling interest in Forjas Taurus. During the next seven years, a great deal of technology and methodology was passed between the two companies. In 1974 Beretta had won a contract to produce small arms for the Brazilian Army. The contract required Beretta to build a Brazilian factory and use Brazilian labor. When the contract ran out in 1980, Beretta sold the plant to Forjas Taurus. By that time, Forjas Taurus had new Brazilian controlling owners that had purchased Forjas Taurus from Bangor Punta in 1977. Forjas Taurus now owned everything that once belonged to Beretta, including drawings, tooling, machinery, and employed a very experienced work force. Forjas Taurus was in the pistol business, and immediately sought to improve on the Beretta design, resulting in the popular and acclaimed Taurus PT-92 and PT-99 9mm pistols. The next milestone for Forjas Taurus came in 1982. Forjas Taurus formed Taurus Holdings, Inc., in Miami, Florida. Taurus Holdings, in turn formed Taurus International Manufacturing, Inc. The Taurus brand was unknown in the United States at that time. This situation was to change dramatically in the next few years. In 1984, Taurus Holdings made an announcement that had a tremendous impact on the entire industry. Taurus Holdings became the first company to offer its customers an unqualified LIFETIME REPAIR POLICY. This changed the course of the company in the U.S. market. Only recently has this policy been matched. It has never been exceeded. This innovative policy made everyone sit up and take notice of Taurus brand firearms.